Despite the name on the can - the large 8.6 - this currently-available-on-PEI beer has an abv of "just" 7.9%. First of all, I should give the disclaimer here that I was given this beer by a friend, and its original blond cousin is, I think, the worst beer I have ever had. So... going into this one, I tried to keep an open mind but was prepared for the worst. This beer has a very small head, but the colour, I thought, was actually quite nice. It has a nice, deep chestnut-red hue. During the pour I noticed that the beer had "legs" - it clung to the sides of the glass like a wine. In the smell are some sweet, malty notes, corn, and a bit of alcohol. Some bready smells come out later as it warms up. The flavour is not what I thought it would be. There is almost a sense of a light medicine... or a strong fruit drink, like a robust cherry something or other. It is way too sweet, or as many beer reviewers like to say, "cloying". A few sips of this was enough. The feel was not what I expected, either. The carbonation level is fine, but this one feels like a runny gel or warmed-up, runny Jell-O. It coats the tongue and some of the inside of the mouth. It's sticky and rather gross. It reminded me of that scene in Anchorman where Steve Carell's character says, "I ate a big red candle." 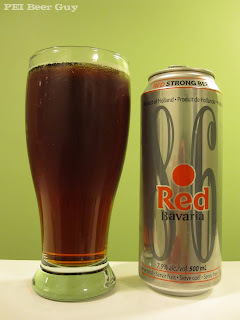 I fully expected this to be the worst or next-to-worst beer I have ever had. It may not be the worst, but it's right up... or down... there. Ugh. Can't wait 'til it gives up its shelf space for something else! Geez, I feel like I just drank it after reading your review! Blech! I'm still waiting for the day you try a fantastic one and have the rest of your beer-drinking days changed for the better! my advice give it a try, at least twice. Chill it properly and pour into a glass. Same as above but add some freshly squeezed lemon or lime juice. like Bavaria Red, Hacker-Pschorr just to name a couple. Thank you for your time reading my comment. Not at all... thanks for the comment. Tell you what... if I'm given one, or my other choices at a moment are low, I'll try what you suggested for the "second try" (as I've already done the first one). I may even try it just to see how it turns out... the first one was so poor it can't help but improve! Is your suggestion more for the blond or the red? Do you prefer lime over lemon or vice versa? As a side note, I had the Hacker-Pschorr Hefe Weisse a couple of years ago and thought it was great! Stay away from blond, red is way better . I would say bavaria is like bock beer without being "bocked"
Hacker Pschorr hefe weisse would be my fav beer. Last week, I had one again, since someone gave me one of these for my birthday a couple of months ago. I tried the lemon juice in it, and it was better. I didn't love it, but I thought it to be more drinkable, for sure. Thanks for the tip on this one!